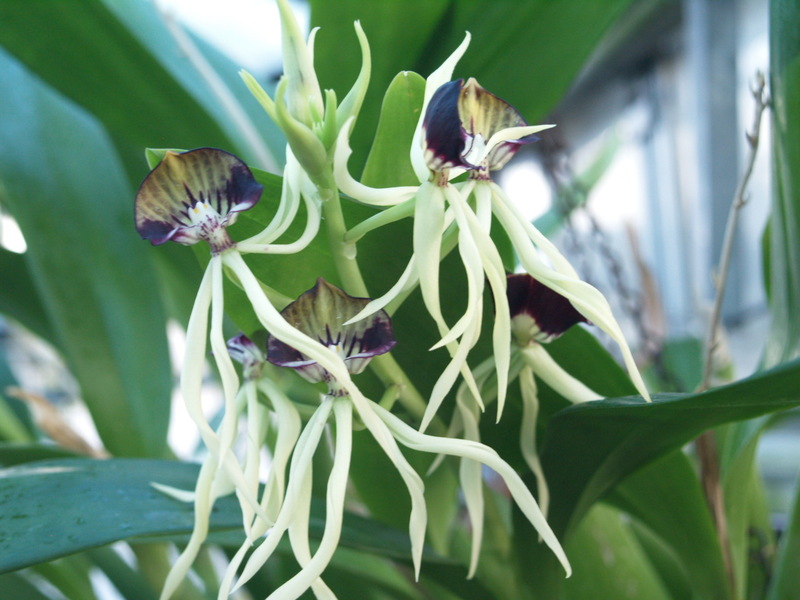 Staying with Prosthecheas, I am going to tell you about Prosthechea garciana. Like cochleata, this orchid is upside down (non-resupinate). However, garciana has a slight citrus fragrance. It comes from Mexico at around 1200m altitude and, in our greenhouse, is found in Warm America. Hello, my name is Heather. I have been a part of the project for two years and dedicate time before, during and after school to it. I am in charge of Cattleya, Brassavola, Tricopillia and Barkeria. The Barkeria spectabilis recently won Orchid of the Year. Over the next few months I will be blogging about my orchids, so keep an eye out for my blogs. The Brassavola nodosa we found on our expedition in Belize. 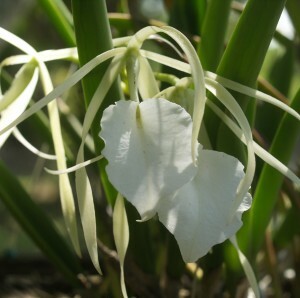 Brassavola nodosa, or ‘Lady of the Night’, is a very popular orchid and has a strong fragrance. It is native to Mexico, Colombia, Venezuela and Central America. It is widely spread along the Gulf of Mexico, southwards from Tampico, so needs to be grown in warm to intermediate conditions with plenty of light. It flowers in autumn and winter and we grow it in Warm America. Our expedition to Belize found lots of this orchid growing in coastal forest and mangrove. Brassavola nodosa was growing in full sun along with Schomburgkia tibicinis, which we also have in Warm America. 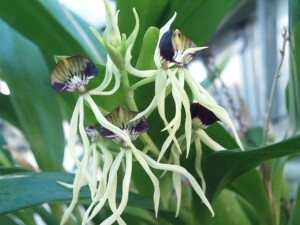 I am going to start with Prosthechea cochleata, national flower of Belize. 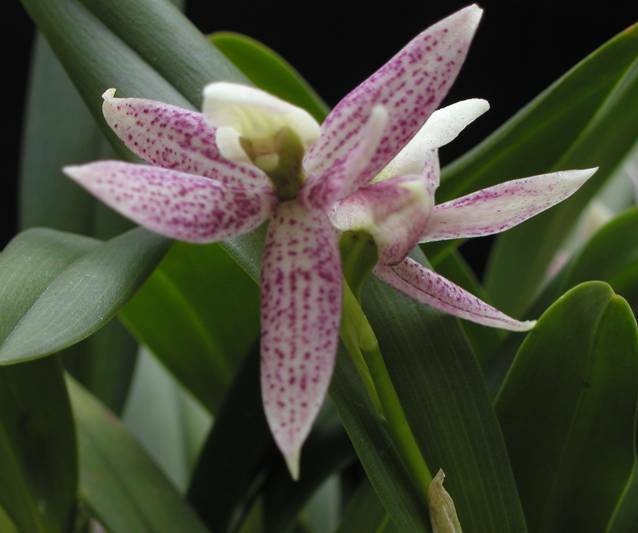 In Warm America, in our greenhouse, at least one of this plant is in flower at any time. This orchid is unusual because its lip is at the top of the flower, not the bottom like most orchids. Some other Prosthechea are the same, but not all. For this reason it is known as the upside-down orchid. 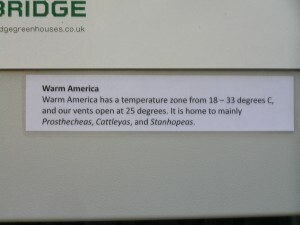 Recently we have been advertising the temperatures we keep our greenhouse at. We have new labels to put with sale plants, the blog and about page say all about it, and now we have signs in all the sections telling you what temperature we keep it at. Every student who is involved in the orchid project is allocated a genus of plants to look after. The more time you give to the orchid project the more plants you get to look after. I have been with the project 2 ½ years now and spend time before school, break time, lunch time, and after school down in the greenhouse or up in the lab. As a result of this I have great fun and get to look after Prosthecheas, Encyclias, and Sophronitis. I am going to give you a short over view of some of my plants over the next week or so. Keep looking and you can learn about my plants.